i’ve eaten at countless restaurants all over the country, and if you were to ask me to name my favorites, souley vegan would be near the top of that list. 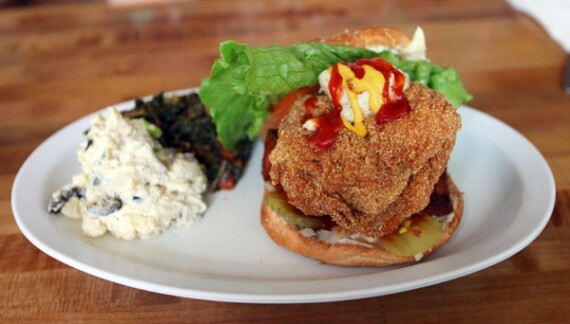 the modest oakland eatery is miles ahead of most of the places we have here in los angeles, what with its home cooked animal-free menu, fried food sensibilities, friendly service, and spacious interior. 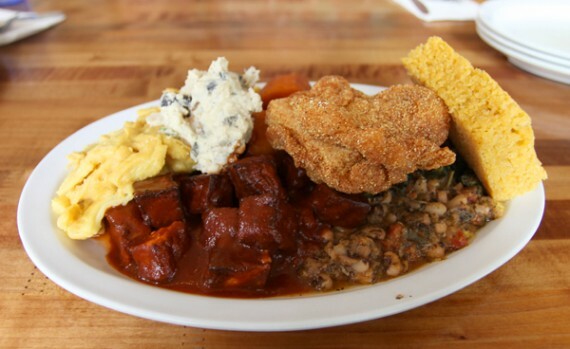 we hit up the northern california soul food joint recently with laura of vegansaurus fame, and it was a meal to remember. 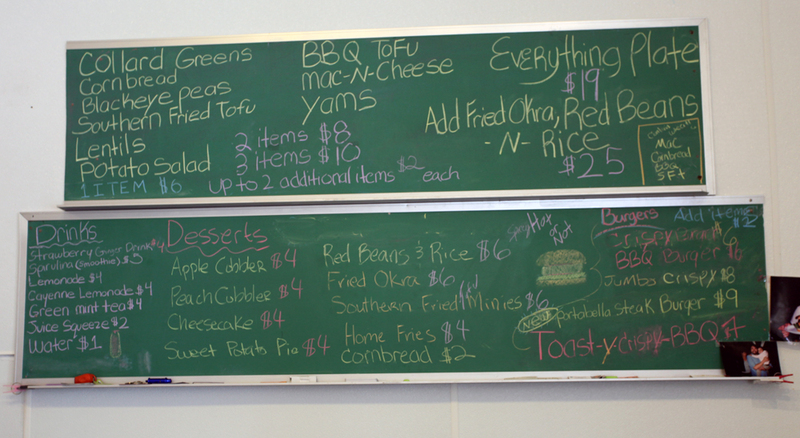 the menu at souley is on this huge chalkboard posted on the wall, and is a little intimidating at first glance. it’s hard to believe that so much vegan goodness exists under one roof. they’ve got everything from collard greens to southern fried tofu, and prices range from 6 bucks per dish to 8 bucks for 2 dishes, and increasingly better value right up to the “everything plate,” which includes almost every side dish available for $19. naturally, that’s what we ordered. 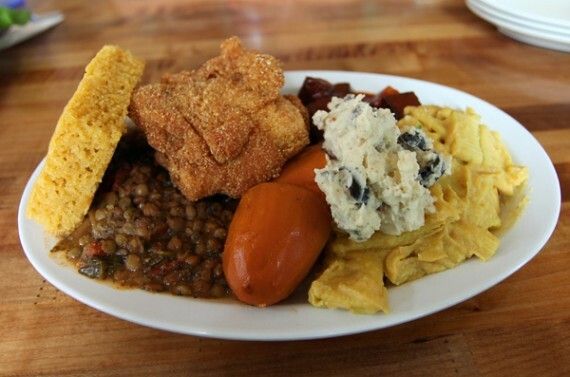 the everything plate is one huge platter stacked up with collard greens, cornbread, black eye peas, southern fried tofu, lentils, potato salad, bbq tofu, mac n cheese, and yams. to call it epic would be an understatement. you can see it pictured at the top of the post from one angle…and below is a shot of it from behind. make no mistake—those orange things are yams, okay?! anyways, this plate was amazing. where do i start? the bbq tofu was well-seasoned and sweet, while the mac and cheese was mild but extra gooey and velvety. the lentils were earthy and tasted great all mixed up with the collard greens (which you can’t even see, because there was so much food on the plate). the potato salad was so damn creamy, i had a hard time believing it was vegan…and the cornbread was like a delicious oily sponge. for an extra $6, you can add fried okra along with beans and rice to your order, but we simply didn’t have room for that. next time! not knowing how much food would arrive, we also got a side of the southern fried tofu on its own. this proved to be a good decision though, because the this tofu was definitely one of the most delicious things on the table. all coated in batter and fried up in a fantastic blend of spices, the skin on this stuff was probably half an inch thick. i’m so glad they served it on a piece of lettuce, because that totally makes this meal healthy, right? the crispy. $6. plus $2 per side. laura was all about ordering the “crispy,” a fried tofu sandwich that she said is one of the best things she’s ever eaten in her life. it came with the same beautiful hunk of tofu we ordered along with condiments and toppings on a bread roll for 6 bucks. you can add sides to your sandwich for just $2 each…so i think next time i am gonna go with this option rather than the everything plate. 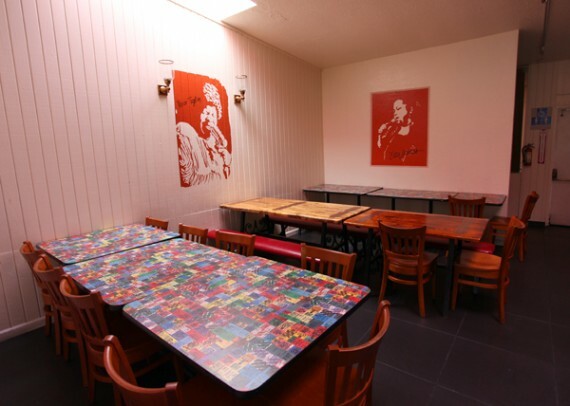 inside, souley vegan is nice and roomy with two separate seating areas to choose from. it was empty when we were there (at around 11am), but we were told to get there early because the place can get packed. with food this good, i don’t doubt it. 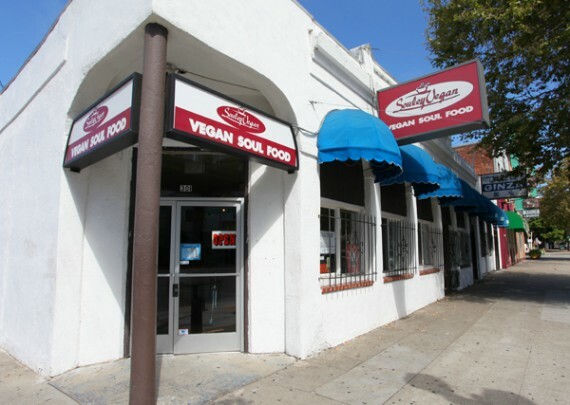 if you are ever in the bay area, souley vegan is a MUST VISIT. 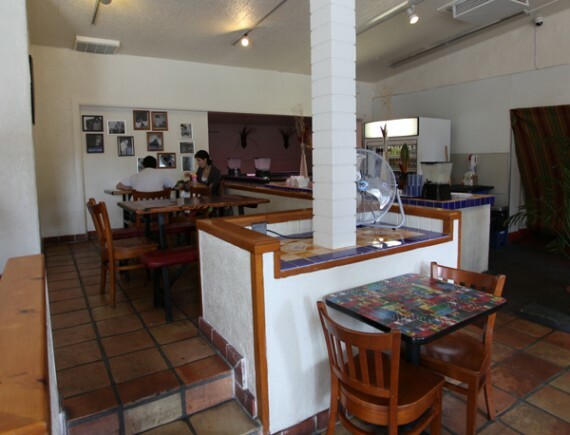 it’s just a short train ride from san francisco, and the restaurant is walkable from the station. 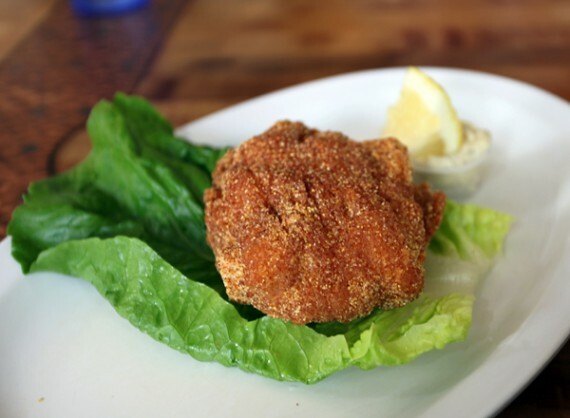 deep fried vegan has never tasted so good!